Day two, Friday, May 5, 2017 began about 6:00am as I became aware that there was daylight outside and that John was already up. We had survived! It was cold but not bitter, the sun was brushing the tops of the trees, a few birds were singing (we wondered about the seeming small number of any kind of wild life on this trip) and it was clearly time to face the day. 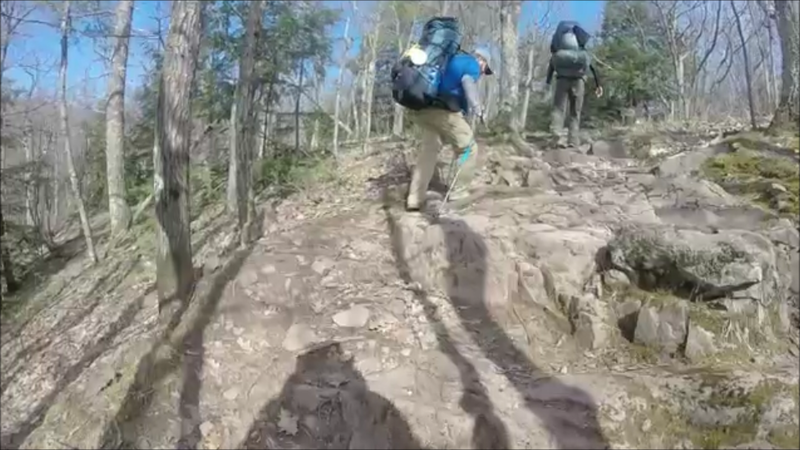 I posted three videos on YouTube of our Day 2 hike from Lake of the Clouds to the mouth of the Big Carp River on Lake Superior where we spent the second night. Click the YouTube video at right for the first segment and then the Part 2 and Part 3 buttons here for the other two parts. ​The hardest part of getting up was that my hammock was still only about six inches off the ground (thankfully that much!). It is kind of hard to put on hiking boots with you bottom side is cradled in a hammock below you knees! At least for me. But somehow, I managed, got bundled up against the cold-ish morning and stumbled down to the fire ring area where John handed me a cup of Via instant coffee! ​Charles was not far behind and so we made our breakfast, more coffee and discussed the day past and ahead. Then came time for packing up. That was slow and clumsy but by about 9:00am we were ready to hit the trail. The climb back up the steep hill on the north side of Lake of the Clouds to the intersection with the Escarpment trail was very steep, and taxing but once there things leveled out as we headed west. Hammock setup at Lake of the Clouds. 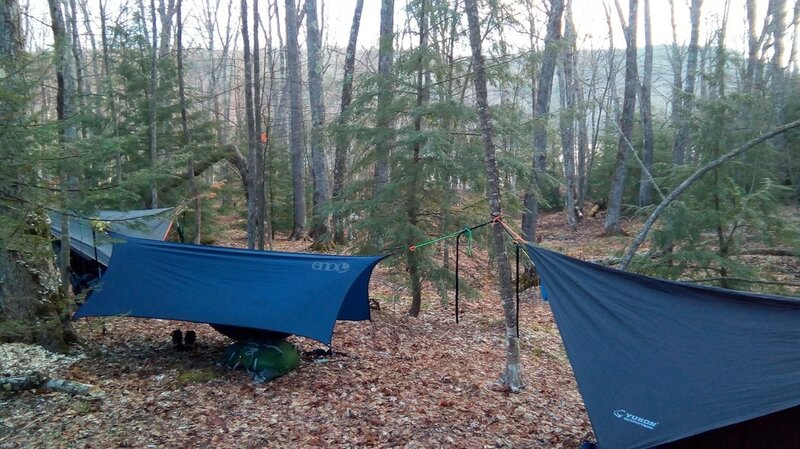 Mine is the ENO one in the center, nearly on the ground! So far, we had only seen a hand full of people since the beginning of our trip, two of them, a couple guys who camped halfway up the hill on the north side of the trail. They probably had a better campsite and when we talked with them on the way out we learned that there was a small water source there too. Uncertainty about that, and a desire to ​be close to the lake are what drove us across the lake the previous evening. Water along the escarpment trail is a potential issue. There are several campsites up there but none have a dependable water source. We were each carrying about two liters of water so were fine for traveling but NOT for camping without a water source. Fairly early in the day's hike we paused at several rather spectacular overlooks along the escarpment giving us great views of the entire valley and the Lake of the Clouds from the west. 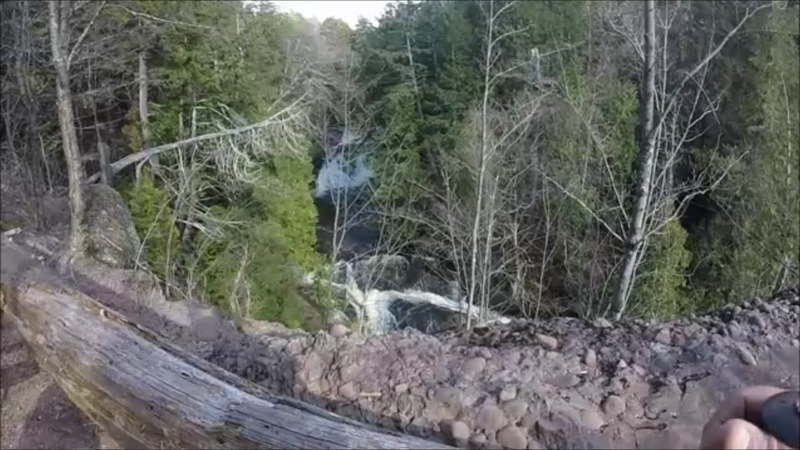 At at least one place the shear rocky cliff dropped down several hundred feet. And this being wilderness, few had any kind of guard rail. Shear cliff of he escarpment. 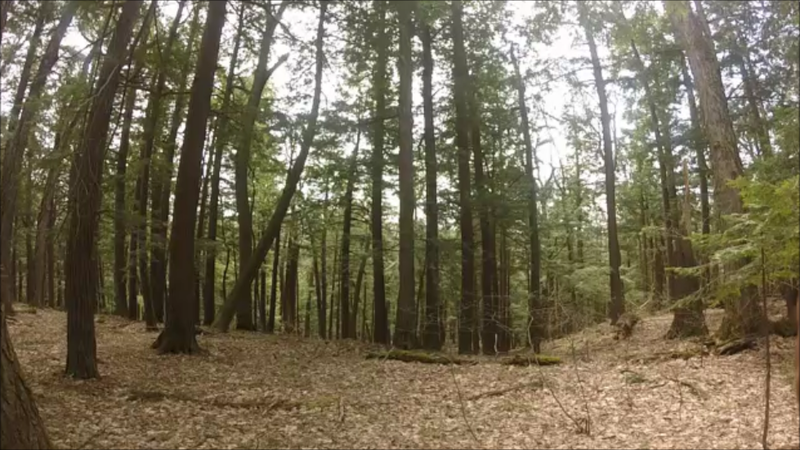 Section of Old Growth forest. Impressive in every way! shelf so that the tops of the trees below were at or not far above eye level. And we were standing in tree filtered sunlight, on brown almost felt like dead vegetation under our feet, little or no undergrowth with huge trunks and tree tops about 20 to 50 feet apart, as far as you could see. It was almost dream-like. We found one long-downed tree to sit and lean on as we ate our lunch of tuna and salmon wraps with mayonnaise, Cheese-its and water. 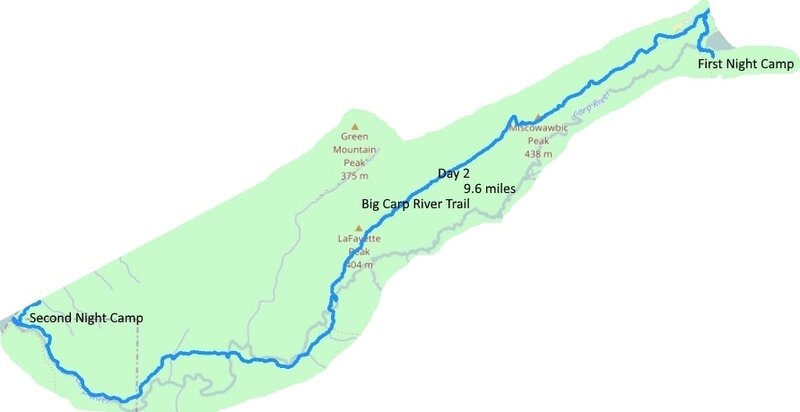 ​After lunch the trail, which was now the Big Carp River Trail began to slope gradually downhill toward the Big Carp River valley. The trees also began to change to the less uniform hardwoods and pines as the trail zig-zagged among them. 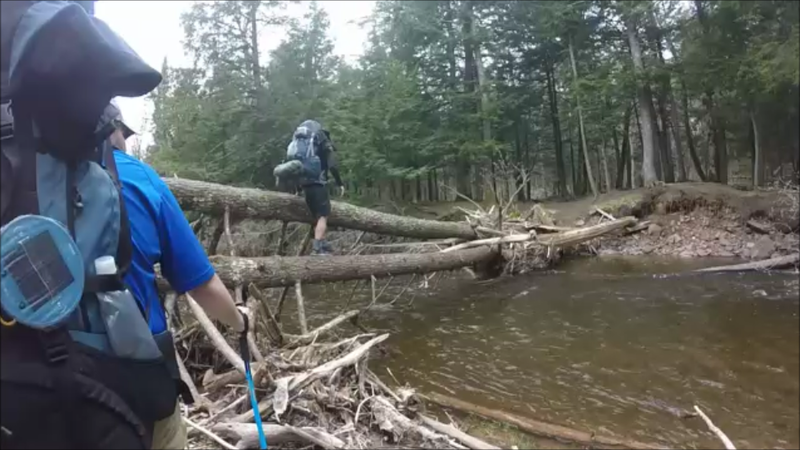 We also began to find more water standing around and in the trail. The water was easily avoided but increasingly took more care to avoid. All along the way to day we again saw evidence of the recent ice storm with downed trees. The usually didn’t interfere with our travel much but occasionally required some problem solving to get past. 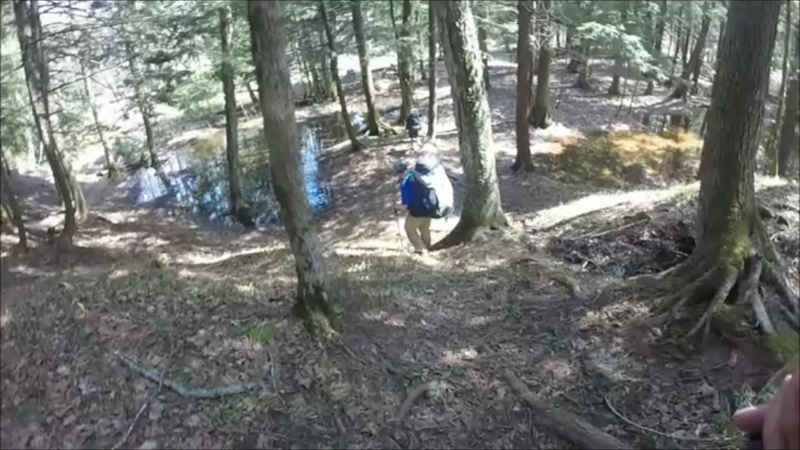 Steep descent down to a campsite area on the Big Carp River. ​And then we found ourselves going down a very steep incline to the river itself which we had now heard rushing along in the decreasing distance. We had met one fellow coming back from the river and he said we would either need to cross on a log or take the safe way and wade across. He said the water was about knee deep. ​That started a search. The river crossing didn’t look too bad so John took off his socks and waded across carrying his backpack and after setting it down on the far bank began searching for the trail. After a few minutes, he came back and said there was no trail over there and crossed back to our side. We decided to retrace our steps back to the last marker we had seen as obviously, we had missed the trail. That required climbing back up that very steep incline. Charles was the first to spot where we had missed the markers. Getting back on the trail we found the intended crossing and waded across further on down the river. John Crossing the "Angel" placed bridge on the Big Carp River! 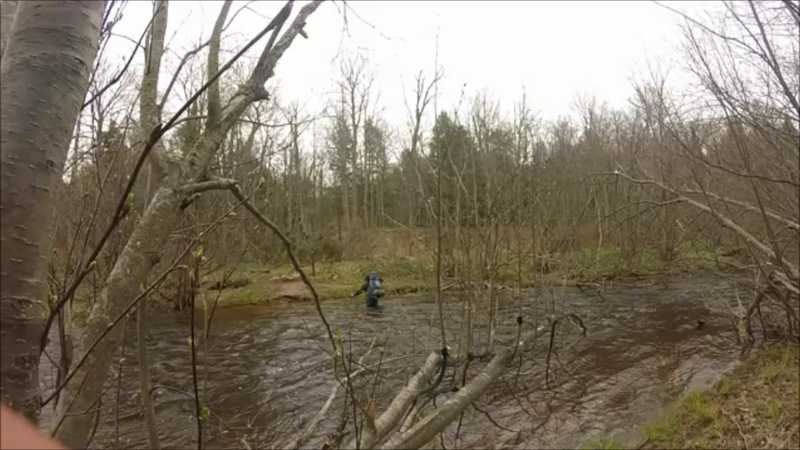 John Wading across the Big Carp River, at the right Place! ​Since the first river crossing we had been anticipating the next one as the map clearly showed that we had to get back on the other side of the river. I’ll admit a fair amount of unease as we walked along. The first one hadn’t been bad at all, in fact other than the very cold water it was kind of fun. But the next one would be further down the river, likely more water and perhaps even faster moving. food items, etc. and most hikers talk quite a bit how those always seem to appear just when you are about to call it quits! Well, I now believe in REAL trail angels. As we rounded a section of the trail, obviously nearing our crossing because the trail was right alongside the river there were two huge trees across the river. The lowest one was about four feet above the bank, washed there by the raging river with its root ball jammed against the far bank and its top snagged in the trees on our side. And just above it, maybe three feet and to its left about a foot and a half was a second one, similarly wedged into the banks, like a custom-made hand rail! And though there wasn’t a ladder to use in climbing up onto that tree there were strategically placed branches that you could both climb and grab onto to hoist yourself up there! The “foot path” log was about two feet in diameter so you practically had a flat walking surface! NO human, no matter how angelic their heart may be could have put those there. But God simply washed them down the river and into place just where WE needed them to be! 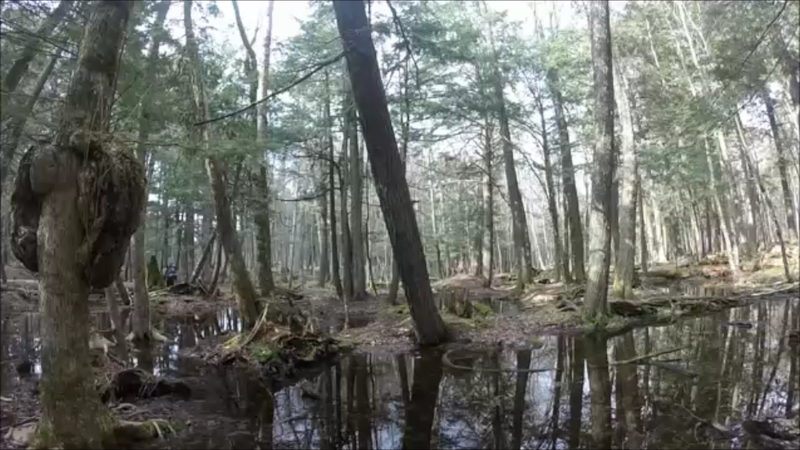 ​Things went smoothly until suddenly we found ourselves facing a nearly impassable swamp! It is kind of hard to describe. The water wasn’t all that deep but was everywhere with the only high ground being where long dead trees had fallen. But there was no way to tell which was completely rotted, therefore giving way under your step and which would hold up. As we started to seek our way through that mess several young guys came from the opposite direction. They said the trail on to the mouth of the river was good once you got through this bog. Probably fifteen minutes later we made it through with somewhat or a whole lot wetter feet but safe and sound with no one falling in the process. One of the many views of Shining Cloud Falls, one of the favorite sites in the park. ​The rest of the way to Shining Cloud Falls was smooth sailing, the now expected occasional blow downs, water puddles, and small ravines, being the only obstacles. It also provided beautiful glimpses of the Big Carp River now and then too as we walked through the low lying forest. 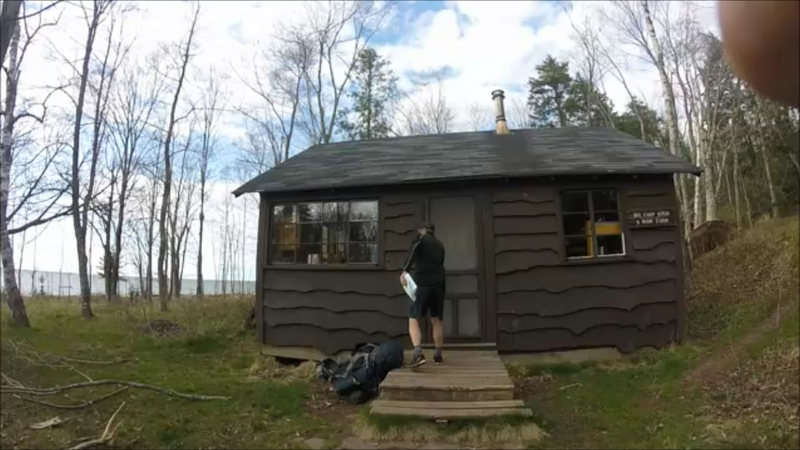 Our cabin on Lake Superior at the end of Day 2. It was a wonderful break from "camping!" around the room were three double bunk beds with very firm foam mattresses. And right in the middle of the cabin was a rustic wood burning stove, complete with a stash of firewood. Oh, and there was a brand new cold-compost very roomy and clean outhouse just 50 feet or so from the cabin! Talk about luxury! Our hike today covered 9.6 miles and we averaged 2.2 miles per hour. Our highest elevation was 1492 feet and the lowest was 653 feet. Our steepest grade was 43.8%. 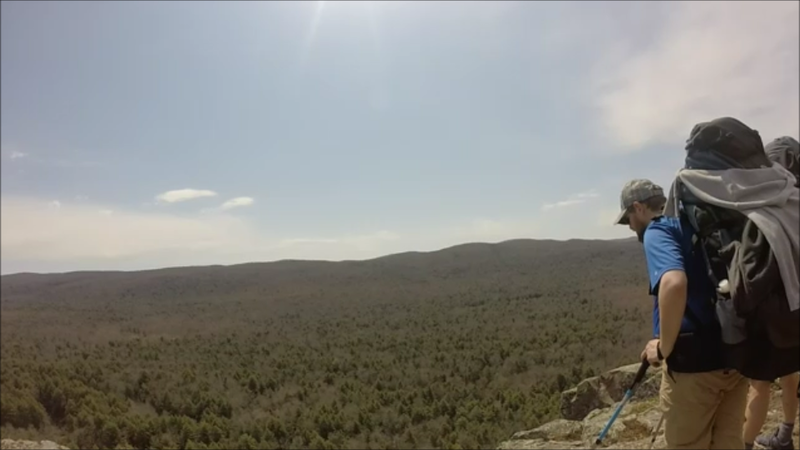 For the record, I think this is the longest single-day hike I've ever done with a backpack! ​It was about 5:00pm when we arrived. After unpacking our bags, I set about building a fire as the temperature was dropping and clearly it was going to be a chilly night. Even Charles was amazed by my fire building skills and before long we had a raging fire, nearly running us outside! ​Dinner today was PakcIt Gourmet’s Dotties Chicken and Dumplings along with a tortilla and PackitGourmet salsa appetizer, ending with pistachio pudding. We liked it better than the carmel flavor of the night before. ​By now it was dark so we dawned our night clothes, crawled into our sleeping bags and slept like rocks, more-or-less. John banked the stove fire and shut down the dampers but sometime during the night it faded away leaving our sleeping bags to do the job, which they did well. It was great to go to sleep with the sound of the river and lake in our ears. It was another bright moonlit, chilly night.